Nearly 1,000 volunteers, contributors and service providers recently gathered to celebrate the 2018 Tulsa Area United Way campaign for the community and look forward to the upcoming 2019 campaign. The local United Way celebrated the success of its 2018 fundraising campaign, which resulted in $25,326,613 for the community. “Serving as your campaign chair was truly the honor of a lifetime,” said Rob Martinovich, 2018 Campaign Chair and Executive Vice President of ONEOK. Martinovich passed the mantle to Kirk Hays, President and CEO of ARVEST Bank, who will serve as 2019 Campaign Chair. Hays challenged guests to increase their support during the upcoming campaign, including companies and organizations that may not have conducted United Way campaigns in the past. Tulsa Area United Way President and CEO Alison Anthony recognized Tulsa Public Schools, which significantly increased the scope of its annual United Way campaign last year. “Amid all the challenges they experienced, the Tulsa Public Schools increased their United Way goal by more than $10,000. Then they blew past that new goal by another $10,000. They also increased their number of leadership donors, defined as annual support of $500 or more, by 35 percent, with overall leadership giving increasing by 50 percent,” she told the audience. Anthony also presented highlights of the 2018 campaign, including 70 new workplace campaigns and increases in giving by area foundations and members of the Alexis de Tocqueville Society, donors who give at a distinguished level. 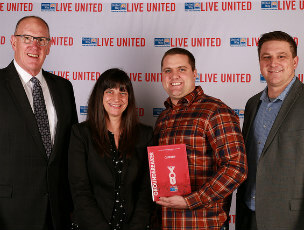 The United Way’s most prestigious awards for individuals went to Frauke Quiroga, CEO of LUXA Enterprises, who received the Clydella Hentschel Award for Women in Leadership, and Wink Kopczynski, III, of Paladin Land Group, who received the Emerging Leaders Society Volunteer of the Year Award for his work on veteran’s affairs. The ​QuikTrip Corporation received the United Way's Groundbreaker Award for conducting the only employee campaign in excess of $2 million. The Bank of Oklahoma won the new Visionary Award for conducting a campaign in excess of $1.5 million. Major supporters included ONEOK, Inc. and Williams, each receiving Cornerstone Awards for support in excess of $1 million. Companies that received Pillar Awards for support of $500,000 or more included Helmerich & Payne, Inc., Magellan Midstream Partners, L.P. and ONE Gas, Inc. The Williams Summit Leadership Award for best overall campaign went to ONEOK, Inc. 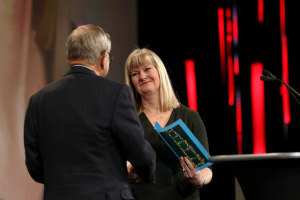 The Community Service Award was earned by First Oklahoma Bank and Tulsa Public Schools for the companies' employees' exceptional service to the community through volunteerism.